Ridgefield has been home to many ministers, priests and rabbis, but perhaps only one bishop. The Rt. Rev. Benjamin Martin Washburn, D.D., a retired Episcopal bishop of the Diocese of Newark, N.J., spent his last eight years living on Barrack Hill Road. He was long active in the administration of the national Episcopal church, but also known for his outspoken criticisms of one of New Jersey’s biggest political bosses. Bishop Washburn was born in 1887 of old New England stock in Vermont. He graduated from Dartmouth in 1907 and studied at the General Theological Seminary of the Protestant Episcopal Church in New York where he received his degree in divinity in 1913. He later earned a doctor of divinity degree from Dartmouth, and a Doctor of Sacred Theology degree from General Theological Seminary. 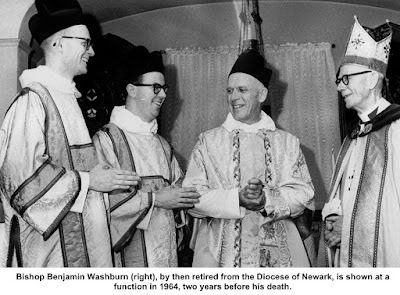 Washburn served as a minister in parishes in New York City, Kansas City, Mo., and Boston before being named bishop coadjutor of the Diocese of Newark in 1932. Three years later he was named bishop, serving until his retirement in 1958. Despite his many duties as bishop, Washburn was also involved in many other areas of church leadership during his 23-year tenure, and during his retirement. He was a member of the board of trustees of the General Theological Seminary, served as president of the Episcopal Church Pension Fund, was on the board of the Church Life Insurance Corporation, and also sat on the board of the corporation that produced Episcopal hymnals. On the civic side, he was active in the New Jersey Historical Society. To keep his critics at a minimum, Hague had enacted a law requiring permits to speak in public. At a rally opposing the law, various permitless people spoke, including two congressmen; a longtime political opponent, who was beaten up and jailed; and Norman Thomas, the presidential candidate (who had once had homes in Ridgefield), who was subsequently “deported” from the city. Washburn and his wife, Henrietta Tracy de Selding Washburn, had one son, Seth (1921-2016), an MIT graduate who became a Bell Laboratories engineer and wrote a seminal book on the design of switching circuits. Seth was also an accomplished musician and a civil rights activist. Bishop Washburn died here in 1966 at the age of 79.